31.07.2010 Updated the code for the file “FiveDateColumnStatus.js” and the CEWP code for ListView, NewForm, DispForm and EditForm. Added support for column name in the mouse over tooltip and the percentage is now “0 %” if none of the date fields are applicable. The CEWP code has changed as the “arrOfFields” has become an object (changed the parameter name to “arrOfFieldsObj”). 29.07.2010 Fixed bug when using using calculated columns and a date field is empty. Thanks to Charlie Epes for noticing the bug. The code for the file “FiveDateColumnStatus.js” is updated. 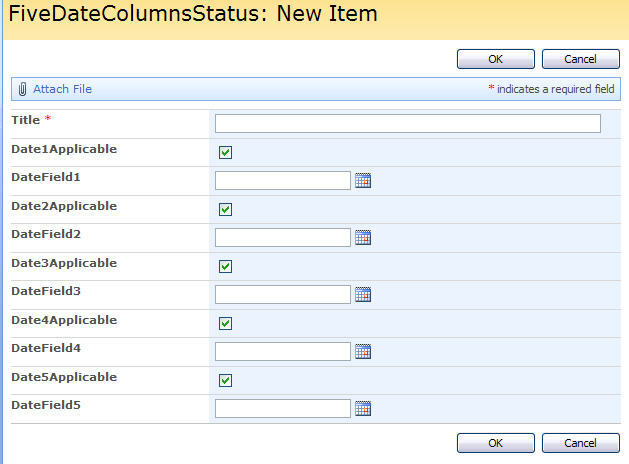 16.07.2010 Updated the file “FiveDateColumnStatus.js” to support calculated columns. 03.07.2010 Updated the code to add DispForm integration and made the number of “date fields” dynamic – you can add as many as you like to the array. The code in the file “FiveDateColumnStatus.js” is updated, and there has been added a new section for DispForm. You are mentioned in the thick of a request started by me. If you want to chime in here, please do! Here’s an example of what I’m trying to do in my List. Let’s say my dog’s veterinarian offers 5 shots for my dog. The vet’s record needs to show the expiration of each of the 5 shots. The vet likes to keep a “score” for my dog showing that Rover is 80% up to date on his shots. Of course there are exceptions. My dog will never need 1 of the shots, so it’s “not applicable” and using it as one of the 5 to calculate my percentage throws off my score. I figure that entering a distant date of 12/31/8900 would indicate that the shot is not applicable. In my case, I’m using a List to indicate the “Health” of a client’s files by giving each client an overall score based on how up to date “eligible” files are. I do not mean to hijack this discussion, but this code was to complex to insert in a comment over at STP… Feel free to continue the discussion where it originally started. I thought of it and found that i could do this in another way than Charlie and Dessie had going in the discussion. My approach reuses some scripts from this article Vertical Scrolling WebPart to get the items from a list view. This approach can be used with grouped views. I have separated the main code in a file named “FiveDateColumnStatus.js”. This file should be saved locally and refered in the CEWP code. The code is found below. The date columns does not have to be in the list view, but the calculated column to hold the status and the “Title (linked to item with edit menu)” must be. A modification from Charlie’s original idea is the presence of a checkbox for each date field to indicate whether it is applicable and should count in the total percentage – or not. If the Checkbox is not checked – the corresponding date column is hidden. This code goes in a CEWP below NewForm and/or EditForm and hides the date fields if the corresponding Yes/No column is not checked. Array of objects containing FieldInternalName for the date column and FieldInternalName for the bool column to select whether the date column is applicable. This code goes in a CEWP below DispForm. It displays the status field in the same way as in the list view. 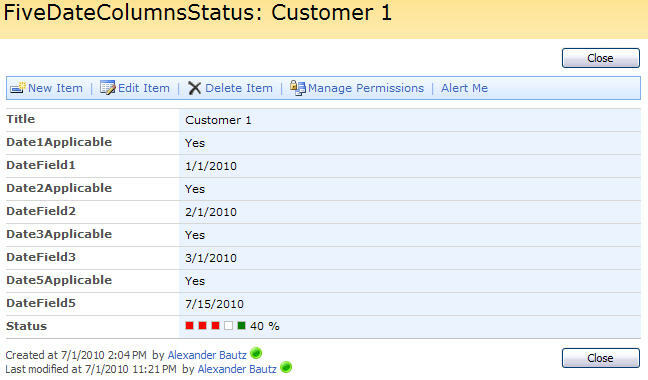 It also hides the date fields if the corresponding Yes/No column is not checked. arrOfDateFieldsObj: Array of objects containing FieldInternalName for the date column, DisplayName for the date column and FieldInternalName for the bool column to select whether the date column is applicable. // Call function to generate "Status field contents"
// Write back the result to the calculated field containig the value "*Status*"
– 29.07.2010: Fixed bug when using using calculated columns and a date field is empty. – 31.07.2010: Added the column name in the mouseover tooltip. If none of the date fields are applicable, the percentage reads "0 %". Save as “FiveDateColumnStatus.js” – mind the file extension and update the script “src” in the CEWP code to point to where you save this script. Alex, this is really cool! Thank you! Also, I added a 6th column and it works perfectly so I assume that the number of columns is not a factor as long as they are in the array. What is the color=date setting? When is something yellow, green or red? scratch the question about the colors… sorry, I re-read your post. I guess I was wrong about adding another date field. Can this be adapted to accomodate any number of date fields? Yes – i will make this adjustments and add the DispForm option – i guess it will be ready during this weekend. The code is updated – see top of article. Thank you Alex!! This significantly broadens the array of SP possibilities. Is there a way that this can work off of a Calculated Column? Example: I have my 5-10 date fields. I need the coloring on a few of the date fields to be triggered from [datefield1] + 485 days. My solution was to create [datefield1_] as a Calc Field. Updated the file “FiveDateColumnStatus.js” to support calculated columns. Thanks for your speedy fix!! I’m having a problem with a calculated column with this code. I have my real date [Date1] and my yes/no [Date1Applicable]. I also have the calc column of Date1 + 485 called [Date1Calc]. When I combine ‘Date1Calc|Date1Applicable’, I get *Status*, instead of the color. Am I doing something wrong? Code updated. See comment in the top of the article. Thank you Alex. This works perfectly!! May I ask for one more tweak? Is it possible to add the column name before the “Due in 12 days” hover? Is it possible to be able to sort this new column by the percentage? One more item: if all the dates are not applicable, can the percentage be 0% or “N/A”. Q1 and Q3 is fixed. Q2 is not possible. See note in the top of the article. Thank you very much Alex!! I am using this solution on another project and it is really useful! Is there a way to show the aggregated average of the item percentages at the top of the color column? Both ungrouped and grouped?